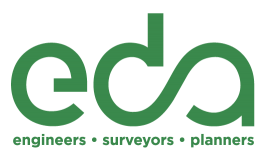 Construction is well underway on the sustainable live-work-play development San Felasco Tech City, and eda is excited to be a part of it! Read the Gainesville Sun article here. 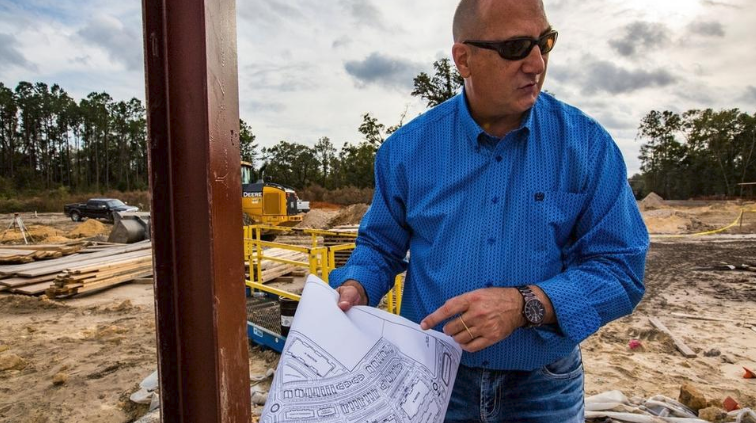 The San Felasco Tech City, the brainchild of Glaeser and Rich Blaser, CEO of Infinite Energy, is under construction. The development will be something of a live-work-play concept, where seasoned companies, like Fracture, that have grown and need more space, can expand. It will also serve as a place for startups to accelerate growth, Glaeser said. The wheels have been turning behind the scenes of the San Felasco Tech City for months. Thursday, at its site off U.S. 441 in Alachua, wheels turning on a tractor were kicking up dirt as its machinery worked to move and level earth. A steel frame had been raised as a skeleton to one of the tech development’s 30,000-square-foot tech buildings. 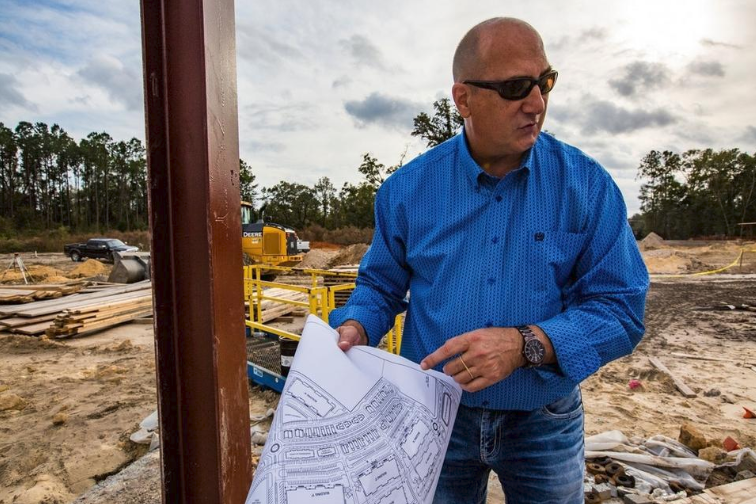 Concrete slabs had been poured to mark square footage already leased by tech companies that have signed on to be a part of the tech city, that should really be called a tech community, said Mitch Glaeser, CEO of the Emory Group of Companies. There will also be several housing units in the community, allowing Tech City tenants and employees the opportunity to move closer to work or collaborate, he said. With a recent purchase of 27 acres of Phoenix Park, made to allow for more homes to be built and green space, the total development will encompass 82 acres, with 300,000 square feet of tech space. The space will be used for research, labs, offices, retail and light manufacturing, among other uses. Six companies have signed on for 42,500 square feet of the project. Fracture, a digital printing company which typically prints on glass, has signed on for 30,000 square feet. Glaeser believes all the available space in Tech City will help keep technology jobs in Gainesville if companies move in, rather than being forced to move to other tech hubs like Tampa. On Thursday, Glaeser proudly held a site plan and pointed out other features to come across the development site: 252 single and multi-family housing units, with a clubhouse, playground and pool area, a coffee and sandwich shop and seven 22-foot solar trees that power the community’s lighting. Also on Thursday, a team at Studio Circle Square, a design and fabrication studio owned by Alexis Dold, the same designer who made the Cade Museum sign, were working on the tech city’s solar trees. Sparks popped as team members welded metal. Dold has designed and nearly completed at least one of the seven solar trees that will stand about two stories tall in the tech city. The trees are made of several metal tubes, which electrical wiring runs through. Each tree has 12 solar panels that collect sunlight from both the top and light that bounces off the ground. They will be painted red. Glaeser said the trees in the tech city may eventually be used as places for people to charge their phones or laptops while they work. However, they will mostly be used to power the development’s lighting system. Each tree will produce three kilowatt hours of power each day, Dold said. “Any left over power will be transferred to its power grid,” he said. Though the trees have a fancy tech feel, they are also a way to make sustainable energy artistic and visible, perhaps inspiring others to “celebrate solar,” Glaeser said. Glaeser said there’s a possibility that he and Dold could create a business making solar trees, which would be run out of Tech City. The first 20 percent, or 60,000 square feet of tech space, will be completed for tenants in April, along with some of the development’s roadways. Phase II, slated for 27 new homes, will begin construction in early 2019. Tech City will join Progress Park, which holds the Sid Martin Biotechnology Incubator, as another technology hub located in the city of Alachua. They’re located just a few miles apart.